Folk Tales of the Coast Salish, Collected and Edited by Thelma Adamson (New York: American Folk-Lore Society, 1934). 430 p.
This books includes song transcriptions by George Herzog. The 155 stories represent Upper Chehalis and Cowlitz Salish narrative traditions, primarily myths and tales, and constitute the largest published body of oral literature for either of these groups. Thelma Adamson was one of the first women to conduct ethnographic fieldwork in the Pacific Northwest. Adamson was a student of Franz Boas in the mid-1920s while a graduate student in anthropology at Columbia University. During the summer of 1926 Adamson and fellow students Melville Jacobs and Otto Klineberg drove across the United Sates together to begin field research with Native American consultants in Washington state. For three months Adamson lived and worked in and around Oakville in the southwest part of the state collecting Upper Chehalis and Cowlitz folktales. The following summer Adamson returned to Oakville and concentrated on collecting ethnological data as well as working on the Cowlitz dialect. Boas also came to Oakville that summer to do field research, and during that time he and Adamson recorded numerous songs by local consultants on wax cylinders (now at the Archives of Traditional Music at Indiana University). 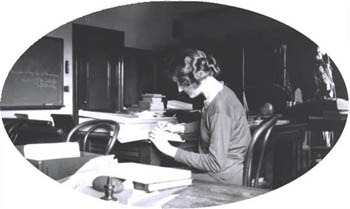 On Boas' recommendation, the University of Washington hired Adamson and Jacobs as "Associates in Anthropology"; in 1928. Jacobs remained on the Anthropology faculty until his death in 1971 - teaching, conducting field research in Washington and Oregon, and building a collection of recordings. Adamson taught one course during spring term 1928 - "Indians of the Northwest Coast"; - and did field work on the Nooksack language that summer, but resigned from the University of Washington in September following her marriage to Edward Salant (it's likely that she'd been married already when she took the position at UW but was reluctant to tell Boas). The rest of the Thelma Adamson story is a sad, even tragic one. In 1929 she became ill with tuberculosis and recovered slowly in a sanitarium. Her dissertation, "Trickster and Transformer Myths of the Coast Salish,"; was approved in May 1929 but never deposited at Columbia or published (a requirement at the time). Adamson returned to Nooksack in 1932 as part of an acculturation study directed by Ruth Benedict, but the whereabouts of her field notes from this trip, as well as those from her 1928 stay, are unknown. Adamson's Folk-Tales of the Coast Salish, including song transcriptions by George Herzog, was published in 1934, but by then her scholarly career was over. She had begun to suffer from mental illness (possibly what would now be diagnosed as bipolar disorder) and was institutionalized in 1942. Until her death in 1983 at the age of 82, she lived as an invalid. [BCBW 2016] "Anthropology" "1900-1950" "First Nations"